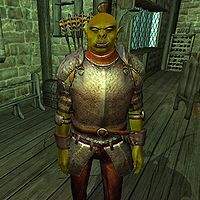 Kurz gro-Baroth is an Orc warrior living in the Chorrol Fighters Guild. He is a member of the Fighters Guild, and like his brother Lum, he spends most of his time practicing, either with an axe in the Guild basement, or with a bow in the back yard. Kurz lives the life of a dutiful Fighters Guild member, spending much of his time training while awaiting a new contract. He starts his day by heading to the Chorrol Fighters Guild at 6am. He will simply wander around the guild for 2 hours until 8am. At this point, he takes a seat at the table on the first floor and eats his breakfast for 2 hours. At 10am, he heads down to the basement of the guild where he will begin training on the practice dummy with his war axe. He will do this until 2pm, at which point he will leave the guild hall and go to the practice targets just behind the guild. He will equip his bow and arrows and shoot at the targets for 2 hours. He will then head back into the guild at 4pm and wander around until dinner at 6pm. He eats his dinner for 2 hours while seated at the table on the first floor. At 8pm, he will once again leave the guild to go to the Great Oak. He will wander around and gossip near the tree for 4 hours. At midnight, he removes his cuirass and will begin to seek out a bed. If he finds a bed, he will sleep for 6 hours. If he is unable to find a bed, he will continue to wander around the Great Oak and resume his schedule at 6am. He wears an iron cuirass, leather bracers, laced leather pants and a pair of stitched leather shoes. He is armed with an iron war axe and an iron bow with iron arrows. He carries the key to the Fighters Guild and a small amount of gold. He will introduce himself with: "Things could always be worse. And probably will be. I'm Kurz gro-Baroth. What can I do for you?" If you have not joined the Fighters Guild he will also say: "You look tough. Want to join the Fighters Guild?" Lum gro-Baroth will mention his brother Kurz's negative outlook on life saying, "I'm Lum gro-Baroth. The cheerful one. My brother, Kurz? He's not so cheerful." When he's practicing archery, Kurz gro-Baroth is a good never-ending source of free arrows, as he never runs out, but keeps shooting at the target. Just collect them from the target before he does, and back off to let him keep firing. Kurz doesn't seek a specific bed when he wants to sleep. Instead he tries to find any bed he can sleep in which isn't owned by someone else. Although he will never fire arrows at the player while he's practicing archery (even if you're invisible or at 100% chameleon), he will disregard any conjured creatures blocking the target and keep firing away. Due to the unique properties of his arrows, they will do no damage upon impact with a live target, but it can on occasion provoke the stricken creature to attack him. This page was last modified on 19 June 2017, at 23:58.